19 July 2015 - Service of celebration was held to formally present the honour to the Corps. The citation below was read by the Chief Executive of the CIty Council Gillian Beasley OBE before the Right Worshipful the Mayor Councillor John Peach presented the scroll to Majors Allister & Kathleen Versfeld. The message was given by Lord Brian Mawhinney. 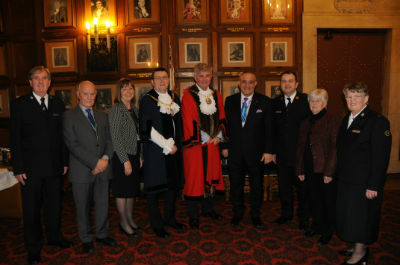 On 4 March 2015 at an Extraordinary Meeting of the City Council the Corps was conferred with the Honorary Freedom of the City of Peterborough. 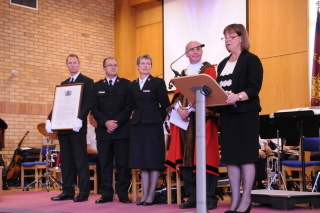 “Council resolves: THAT we, the Members of Peterborough City Council, assembled in accordance with Section 249(5) of the Local Government Act 1972 acknowledge the eminent service rendered to the City by The Salvation Army. Primarily a church and well-known for its work as a charity, the Salvation Army tirelessly strives to reach out and serve communities all over the world. Founded in the East End of London, the Army reached Peterborough in 1881 and since then the self-proclaimed ‘poor man’s cathedral’ has been making a significant difference through their remarkable labours. Heart to God; Hand to Man. There is an impressive array of examples that illustrate their efforts to live by this slogan. After the Great War they were the first to set up safe houses and soup kitchens, affording vital aid to the injured. Every Christmas they host an event for those who have nowhere else to go, providing a traditional meal and perhaps even more praiseworthy; a family to share. Never fearing the tough battles, the Army also runs a transportation service for victims of human trafficking, moving them to safe houses and offering them practical support and counselling. Thanks to these admirable soldiers, there is never a need for anyone to feel lonely in Peterborough. Their Community Centre presents a variety of services, including showering and laundry facilities and food parcels. Twice a week they offer a Luncheon Club and Day Centre for the elderly, and play host to many groups from the community including a Café for Dementia sufferers and ante-natal classes. They also offer a Debt Advice Service which operates on a weekly basis The Good Neighbours Scheme supports the most vulnerable people of the city, visiting them at home and providing a listening ear as well as help in the garden and with their shopping. The Army is involved in several key events in the city, including Christmas Eve carol singing, Remembrance Services, visiting PC Hospital on Christmas day and the Crematorium Annual Remembrance Service. Working in partnership with various other organisations such as Hope Into Action, the Citizen’s Advice Bureau and the council, the Army seeks to aid all those who suffer, never allowing differences of race or religion to hinder their fight. In fact the Salvation Army has played a major role in the interfaith cohesion work in Peterborough. In July this year the Salvation Army will celebrate worldwide to mark an outstanding 150 years of service and ministry. Peterborough has shared in the benefits of this, where this force for good continually step up and bring both aid and joy to millions.